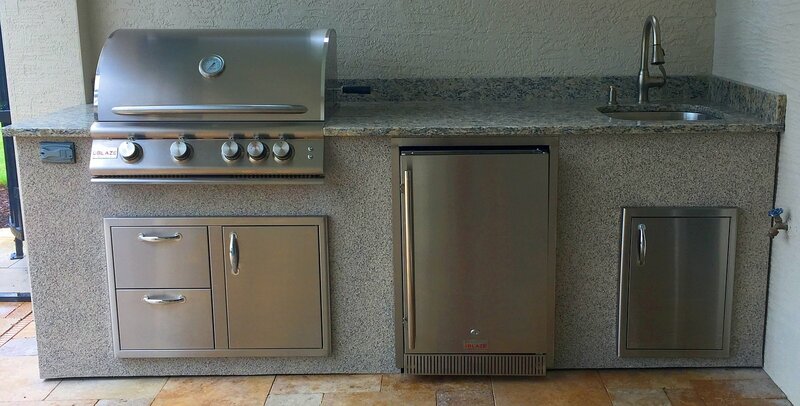 Our stacked stone and stucco outdoor kitchens are custom built using heavy gage aluminum square tubing to provide lasting strength and durability. Each cabinet is built to your opening and appliance specifications. The aluminum framework is encased with a cement board cladding to provide a structural backer for the stucco or stacked stone overlay. Our aluminum frame outdoor cabinets can withstand the outdoor elements for decades. The framed islands include leveling feet and appropriate vented grills for proper ventilation. 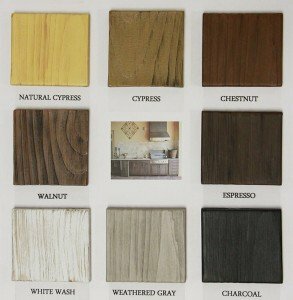 Our woodgrain PVC cabinets are constructed of the finest PVC composite material and ResinKast high density urethane resin. These cabinets are constructed in the traditional European box structure with high grade stainless steel hinges and hardware. Each component is built for structural stability and integrity to sustain the harsh Florida UV rays and intense heat. The main structure is comprised of ¾” PVC with the ResinKast woodgrain cladding. The doors and drawers are also constructed with the PVC structural base and resin cladding. The units include leveling feet and appropriate vented grills for proper ventilation. 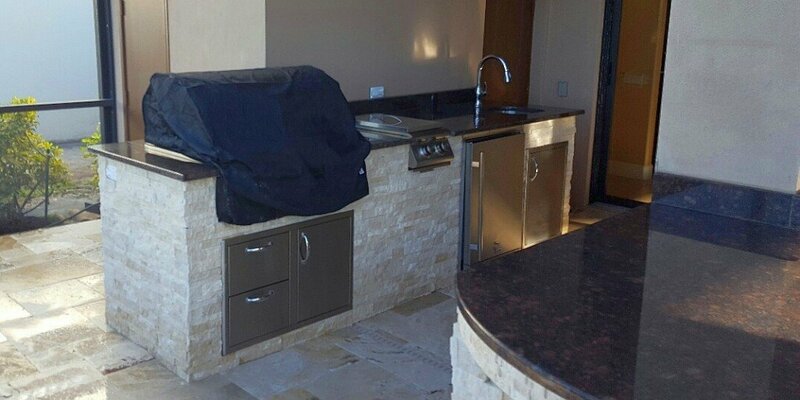 Backyards n More custom outdoor kitchens have professional options on the cabinet as well. We offer Aluminum and Polymer Cabinets that will last a lifetime in this harsh saltwater environment. M.I.G. and T.I.G. Welded Aluminum Frames are made from sturdy 6063 grade aluminum. The cabinets are then wrapped in 1/4″ or 1/2″ hardie board. The cabinet is customized with brick, veneer, ledgestone, or stuccco to make you and your family’s ideal backyard kitchen. Polymer cabinets are custom designed. Each drawer, panel, cabinet piece is custom cut to fit the needs of the client’s project. Several options of profiles, patterns, milling, and colors available. The cabinetry is designed to last a lifetime, creates an area that is beautiful yet functions to you and your family’s specific needs or wants. Enjoy our gallery of ideas for your next custom cabinet project. Let one of our designers at Backyards n More show you all there is available when building your family’s dream custom cabinet project. Let us provide you and your family with a place that will create memories for a lifetime. Where grilling starts and flavor begins. Blazes new line of Gas Grills offers a combination of solid engineering, quality stainless steel construction and commercial-grade cast stainless steel burners to help ensure your Blaze grill will last for years and provide maximum performance. The Finest Outdoor Grills You Can Buy. For more than 80 years, Fire Magic has been building the world’s finest outdoor grills, for people who demand the highest quality and performance. FM passion for manufacturing premium grills comes through in the pride of ownership that you’ll enjoy for a lifetime. Made from the highest quality materials, with the most advanced features for today’s discerning outdoor cook, and backed by the industry’s best warranty, Fire Magic is the last grill you’ll need to buy. 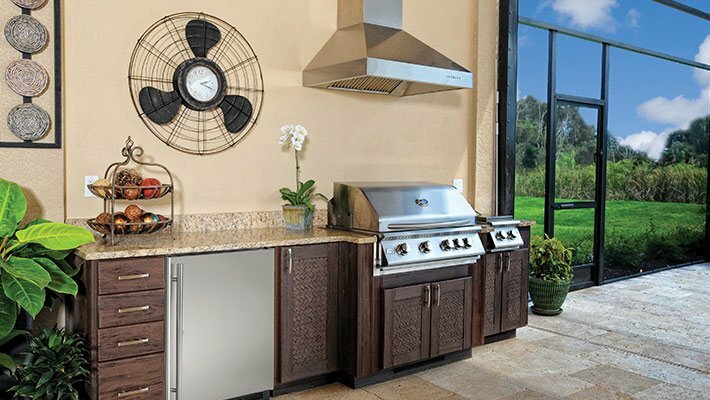 And with an extensive line of premium accessories from refrigerators to side burners, Fire Magic makes it easy to create an extraordinary outdoor kitchen. Discover the grill you’ve been dreaming of.